A very tranquil card for you today highlighting a free sale-a-bration set that might not have caught your eye at first. 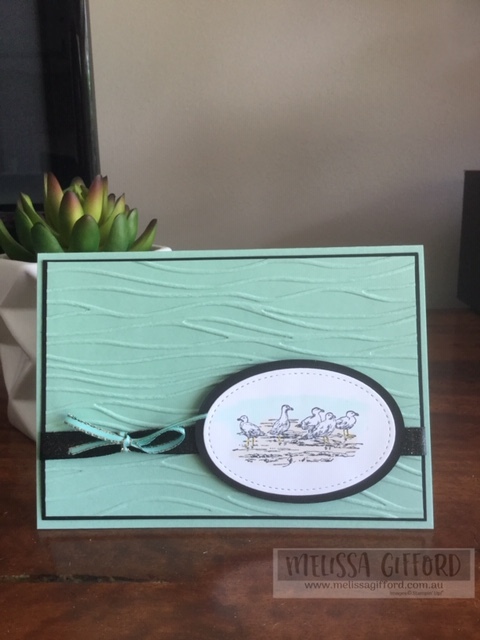 The seaside embossing folder creates beautiful soft waves on the coastal cabana cardstock and I think it looks really striking against the black. I stamped the image in memento black ink then softly coloured it with a couple of colours of blends markers. The black shimmer ribbon has a lovely silvery fleck in it and he little bow is from the tea room ribbon combo pack. I have left this card without a sentiment on purpose but I think it would suit a variety of occasions - thinking of you, sympathy, masculine birthday card. Make sure you get your hands on this set by Sunday before it disappears for good!